Kimmi's Dairyland: Dairy FAQ: Do antibiotics used in dairy cows enter the food supply? Dairy FAQ: Do antibiotics used in dairy cows enter the food supply? Have you ever wondered about how farmers keep antibiotic residue out of the food supply? There's been quite a buzz lately on social media about antibiotic use in livestock. A lot of it stemmed from Subway's announcement that they will phase out meat from animals treated with antibiotics within the next 10 years. Personally, I also do not want to eat meat with antibiotic residue in it either. I'm also against animals not being treated with antibiotics when they are sick. It's the right and the humane thing to do. However, eating meat and drinking milk from animals that have at some point in their life been treated with antibiotics does not mean you are eating and drinking antibiotic residue. Subway recently announced that within the next decade they will move toward serving only protein from animals never treated with antibiotics in their more than 25,000 locations nationwide. This isn't only those antibiotics used in human medicine, this also includes those that are only used when an animal is ill. Many times, an illness can be cured with an antibiotic, much the same way that going to the doctor and getting something can help you or your child. Antibiotics help keep animals healthy because, just like people, they do catch a cold or infection from time to time. There are a lot of procedures in place on the farm to keep antibiotic residues out of the food supply. On most (if not all--I haven't seen every antibiotic on the market) labels on pharmaceutical containers, there are meat and milk withdrawl times. This represents the amount of time the residue takes to exit the body. Let's pretend there's a 48 hour milk withdrawl and 10 day meat withdrawl on a particular pharmaceutical. Cows (and animals in general) metabolize things differently, so while a milk withdrawl time may be 48 hours, dairy farmers generally test the milk before putting it back into the bulk tank (refrigerated tank on the farm where the milk stays chilled). This withdrawl time starts at the time of the last treatment. One cow may be clean 36 hours later and another 52 hours later, it's not always the same, which is why testing the milk is important. Meat withdrawl times are longer than those for milk. The 10 days begins at the last treatment, just like for milk, and says the animal should not be slaughtered until that period is up. It's not a bad idea to add some time to that if the cow is going to be culled just to be safe. I have a lot of confidence in our food supply. 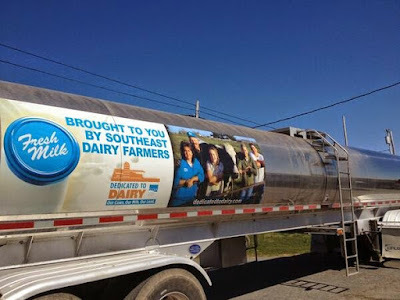 After being heavily involved in the dairy industry for most of my life, both on the farm and within industry organizations and companies, I've seen firsthand the practices farmers and those that work with them use to keep the food supply safe. Repercussions are stiff when something goes wrong, so farmers are very careful. Ship a load of milk with antibiotic residue and not only will that load be returned to dump in the manure lagoon, but you will also end up buying the entire load. Yes, that includes all of the milk on the truck, not just yours. At around $10,000 (varies depending on the milk price) a load, that's something to take seriously. The milk truck backed up to the milk house to load the milk to take it to the milk plant for processing. This happens every day or two. There are actually laws in each state that state how long raw milk can remain on the farm in the refrigerated bulk tank. I've been at a milk plant when a load was rejected for an antibiotic residue. What followed was about 12 hours of loading milk onto milk trucks and hauling it to a lagoon. This involved many, many trips. I was a field rep for a milk marketing cooperative at the time and my coworker and I couldn't go home until all of the milk had been disposed of. While this type of event is rare, seeing it for myself gave me more confidence that all of the safeguards that are in place do indeed work. If it's not caught on the farm, it will be caught at the plant. It doesn't reach consumers. This is a good thing. There are people like veterinarians, nutritionists and numerous others that provide guidance to farmers to help them provide the best care possible for their animals and also to keep the food supply safe. I don't know as much about the meat side of things when it comes to slaughter plants, but I do know that USDA generally has inspectors testing a percentage of the meat that comes through the doors. Creating a safe food supply starts at the farm level. I'm thankful I live in a country where I don't have to worry about whether the meat or milk I buy in the grocery store or at a restaurant is safe or whether it may have some antibiotic residue in it. Where is you farm in Indiana? My family's farm is in Washington State. I moved to Indiana after college and spend time on my friend's farms when I'm not running back and forth across the country to see the fam. Hi Kimmi, your farm is wonderful. Thanks to share farm information with us. Keep it up to share such information about it.